This 1884 book is the most encouraging book I’ve read in the field of prophecy in a long time (and I’ve read a lot!). It is a collection of extended articles on the Second Coming, all emphasizing the literal interpretation of prophetic passages and the pre-millennial return of Christ. 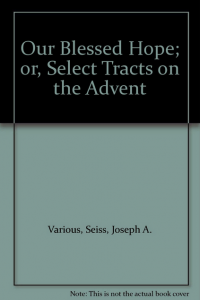 Authors include Joseph Seiss and Bishop J.C. Ryle of Liverpool, England. Other topics mentioned within these pages are: the pretribulational rapture of the church; the biblical dispensations; the regathering of Israel after the glorious return of Christ; the literal nature of the kingdom of God; and some pointed remarks against what today would be called the preterist view. One article by William Trotter titled “Outlines Of Prophetic Truth,” talked extensively about the church beginning on the Day of Pentecost with the baptism of the Holy Spirit, and the mystery of the church that was hidden in the Old Testament economy. Trotter’s article also mentioned the failure of the church in the age of grace to live in the world without being a part of the world, and also specifically described the rapture of the church before the tribulation period. Great book!